I don’t know how many times my mind has returned to this moment. 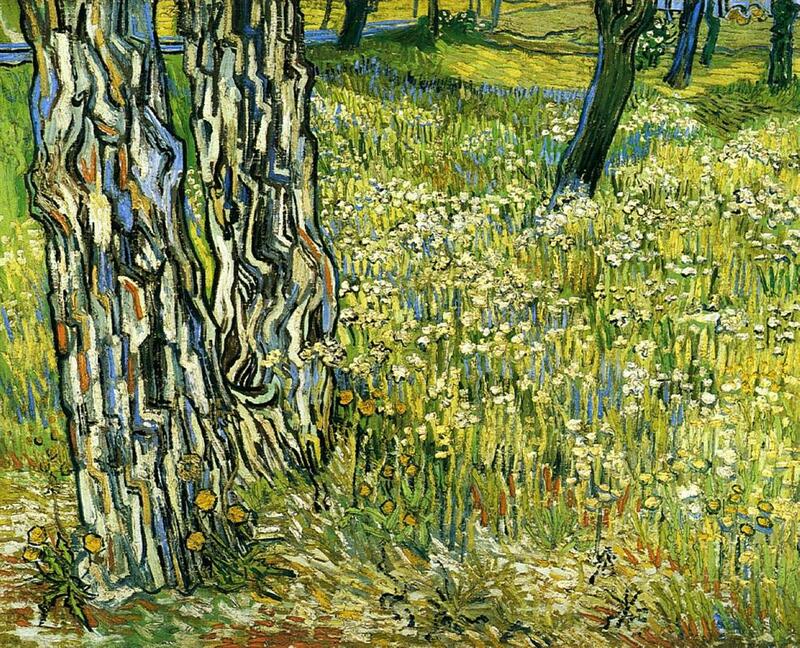 A sunny day of a spring long past, and my fifteen-year-old self looking at Van Gogh’s blue trunks (the reproduction had been there on my wall for seven years): letting go of the dreams of my childhood. This intense power of colour, I thought, is so far beyond my wildest dreams, so what’s the point? I had to decide, right there and then. It might have seemed like a simple choice between two different high schools, but I knew it would determine the unfolding of my life for years to come — or, at the very least, limit my options for any further education. One school was the natural next step in my training as a painter, an auxiliary of the art school I wanted to attend. Filled as it was with budding visual artists, it offered but rudimentary basics in all other subjects. The other was for children gifted in math and sciences, and this choice would mean abandoning the dream of painting professionally — the art school was highly competitive, and there was no way I could prepare an adequate portfolio without concentrating on my painting studies fully and exclusively, and without proper mentorship. Only a few weeks before, I wouldn’t even consider abandoning painting — but then and there, on this sunny afternoon, I decided to do just that. The memory of this moment is vivid and alive, as though it happened yesterday: the warm sunlight on Van Gogh’s blue tree, my blue grief for the dying dream mixed with an unexpected orange-y feeling of relief, freedom — even excitement. And yet I know this memory must be a mirage, a construct of my mind. That’s what science tells us: whenever a memory is recalled, it changes — and it is this modified memory of remembrance that is stored in place of the original one, to be recalled and modified again at a later date. Paradoxically, the most important moments of our lives, the memories that appear most vivid and precise are also the ones most irrevocably transformed by these recurrent waves of memory and contemplation. My mind has to accept that this pivotal moment, a cornerstone of my psyche, might never have happened in the form it lives in my memory. And yet the illusion doesn’t dissolve in the light of knowledge (just like, for all I can see, the sun still sets every evening and rises every morning). Even if this moment wasn’t a part of my past, it certainly is a part of my present. And within this mirage, there is another, even more seductive, illusion: the illusion of making a decision, the famous illusion of free will. For all we know, when a human being experiences making a conscious choice, the decision has already happened somewhere well below the threshold of conscious awareness, in the unfathomable electro-chemical-neural ocean of wildly firing neurones. All that happens in the moment of “decision” is that the mind finally gets informed of the choice, so it can go ahead and rationalise it — or regret it. Was it me who made this pivotal decision of my life? The answer must certainly be negative if I identify with my conscious, thinking, story-telling mind. It may be positive if I think of me as this whole human animal — except this body interacts with its environment in a multitude of ways far beyond our comprehension, and this makes the separation between me and not-me dubious at best. All in all, Life — of which this human animal that is me is an inherent (even if fleeting) element — made this decision for me, and the mind was left to live with it and think about it all it wants. And since my mind has lived with it for more than thirty years by now, it has all kind of stories about it. It could spin a winter’s tale of fear and regret, a moment of weakness, a failure of courage to do what one loves — even blaming my parents for their subtle pressure towards a safer, more familiar route of intellect and science. Or it could tell a summer’s story of a young, budding intellect wanting food for growth and refinement — focusing on all the peak experiences, all insights, discoveries, and achievements that would eventually spring from that decision. Or anything in between… — whatever version there is, I seem to have been there and thought that.